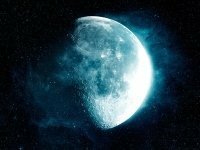 People born in the first quarter of the moon are active and assertive. They have many abilities, so it's hard to concentrate on one thing. They strive to stand out. First, they face difficulties, since there is no ability to interact harmoniously with other people. Very subjective. In assessing the events that occur, they are not guided by the facts, but by their own feelings. Often fail, because they can not really assess their strength. The most active period of life is after 30 years. A person becomes more realistic, can already decide on his professional direction, and by 40-45 years succeeds. The best period for concluding a family union. The marriages made at this time will be extremely fortunate and happy. Love and interest between spouses will only grow with the years. The growing Moon is the time to move towards the goal, to achieve plans, to prosperity. She begins to gain her former power, and with her grow magical powers. This is still only echoes of the former power, but they can have the most favorable effect during the rituals of love magic or money magic.